Being back in London after travelling extensively in June and July, I am beginning to miss travel sooner than I thought I would. Maybe cold rainy weather in the UK at the moment are making me feel nostalgic. Maybe it is thinking about all the fun I had while travelling this summer and wanting to experience it again. Or maybe it’s just my nature. Most likely, it’s the combination of all three. My next trip is not until 18th September. There are plenty of things to enjoy in London in the meantime. Plus, a break from travelling gives me the time I need to write about my experiences and relive them again. We started our trip in Southern Cataluña in the Tarragona region. A small town called Cambrils has been my family’s holiday destination for years. Not many people know about it and that’s part of the appeal for me. Cambrils is a former fishermen’s village that grew into a bigger town. Main attractions for me include: numerous stylish restaurants serving delicious regional food, including an elegant Michelin star restaurant Can Bosch, a beautiful marina, several beaches with a wide strip of golden sand and stylish boutiques. Not a beach resort in sight. If you are in the region, I highly recommend a trip to Tarragona. It is an old Roman city with a lot of Roman architecture to enjoy if you are a history lover. When it’s hot, you can seek shade in the narrow streets of the old city centre while popping into small cafes for coffee or tapas. The views and colours are breathtaking. Our next destination was Northern Cataluña, a picturesque part of the country close to the French border. Calella de Palafrugell was our first stop on this leg of the journey. Tucked between the hills, this beautiful tiny seaside town has numerous pebble beaches, white washed houses and cozy outdoor restaurants. Our hotel room with a sea front view was simply perfect. This idyllic town infused me with inspiration and joy. I had forgotten what it felt like to discover a new place and do absolutely nothing (not even sightseeing), but have fun, luckily, a few days in Calella helped me to reconnect with fun. With very fond memories, we left Calella to visit our next destination – romantic Cadaques. 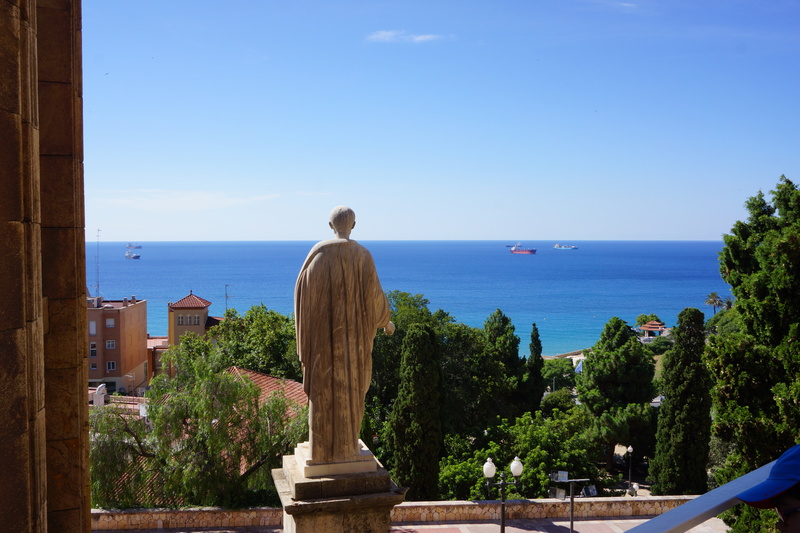 This beautiful town is famous for being Salvador Dali’s summer home and his house is now a popular museum (that needs to be booked in advance during the busy summer period). Cadaques is stunning. There is something about it, perhaps its old charm of an early 20th century resort town, or perhaps its geographic location behind mountains on a dramatic coastline that draws you in immediately. Our hotel was in a quiet part of town overlooking the mountains. Smell of lavender and aromatic flowers made me want to come back for a longer stay. 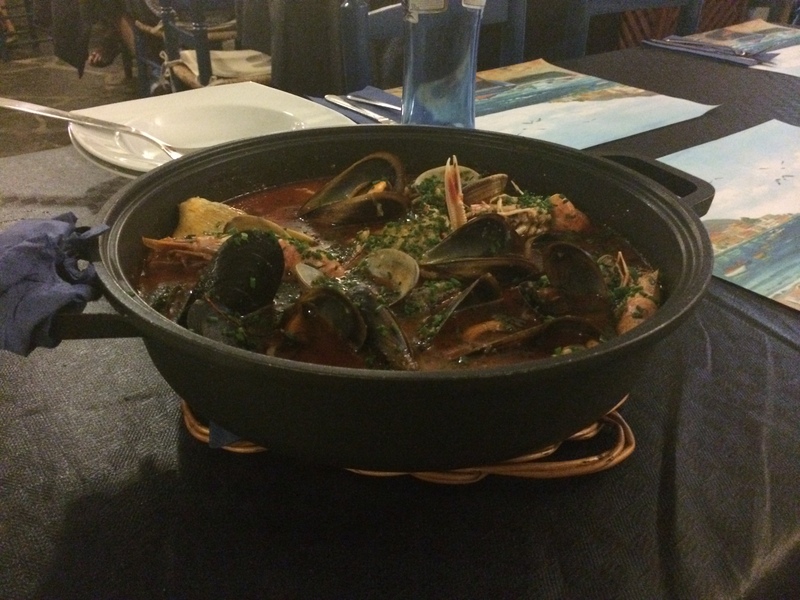 My most memorable part of the Cadaques stay is an exquisite meal at La Sirena, a small local restaurant, hidden in the small streets of old town – enjoying a typical local dish called Zarzuela (fish stew). It’s a must if you are in there area. 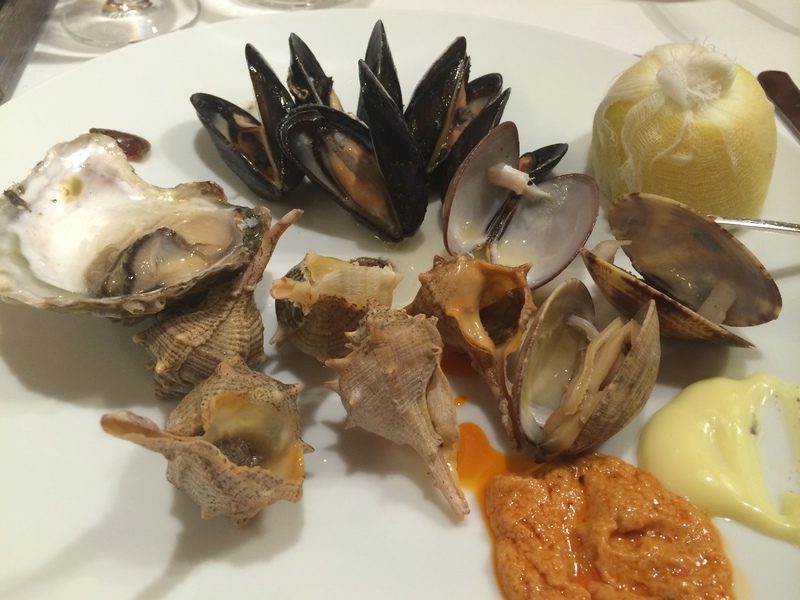 For me, gastronomy is one of Cataluña’s main attractions. Other delicious local dishes to try include: fedaua with seafood (vermicelli paella), chipirones (fried baby squid), pulpo (octopus) in all forms, sea salt baked fish. 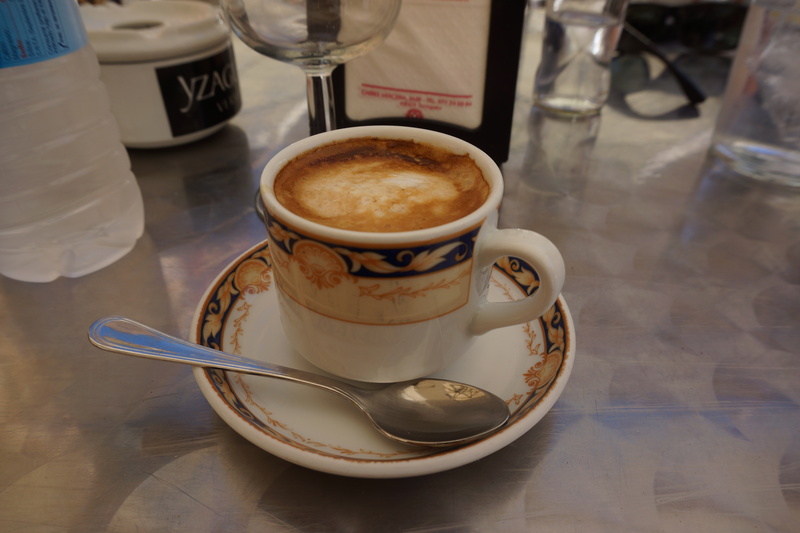 Fresh fruit, exquisite local vines (we particularly liked the Priorat region wines) and my favourite way to enjoy coffee – cafe cortado (espresso with a bit of milk) are all reasons why I love Spain so much. Our final destination was one of my favourite cities in the world, Barcelona. Each time I come here, I cannot get enough of its relaxed vibe, beautiful architecture and amazing yet seemingly effortless stylishness in everything. Our hotel, H10 Art Gallery, with art-inspired decor and a rooftop pool in Eixample was a perfect base to enjoy the city from. The street we were on, Career d’Enric Granados, had numerous stylish cafes and restaurants within minutes. If you want to try something less traditional, you may like Imprevist, a restaurant in Raval we discovered on our first night. A relaxed local vibe coupled with an interesting menu made up of experimental versions of Catalan dishes make it a good choice if you want a quiet night out. Deserts are particularly experimental. For a lively night out head to El Born in the old town next to Ciutadella Park. Here you will find numerous bars, restaurants and tapas bars with stylish design, delicious food and great atmosphere. You can have picnic in the park during the day or go to Barceloneta beach. Barcelona has something for everyone – whether you like modern or traditional, quiet or buzzy, beach or history. These pictures show the Barcelona I love. Have you been to this beautiful city? 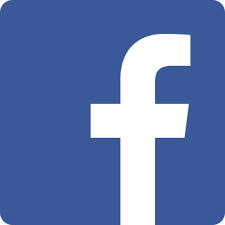 What do you enjoy doing, seeing, experiencing there?